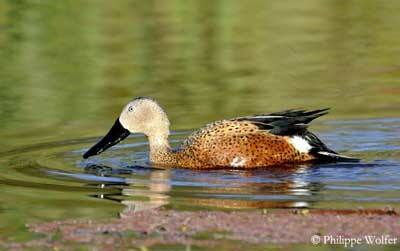 The Red Shoveler is the only shoveler of South America. The adult male has reddish-cinnamon mantel, breast and belly, heavily spotted black. Back and rump are blackish. A white patch is visible on each side of the vent. The upperwing shows blackish primary flight feathers and green and black secondaries. The upperwing-coverts are pale blue with broadly white-tipped great coverts. The scapulars are elongated and black streaked white. The underwing is white with brownish-tipped flight feathers. The tail is pointed with white outer rectrices and black median tail feathers. Head and neck are greyish and uniform, but the crown may be slightly spotted black. The large, broad bill is black. The eyes are pale bluish-white. Legs and webbed feet are yellow or orange. This species has no eclipse plumage. The female is slightly different with dull yellowish body. The dark brown feathers are edged pale yellowish, giving a large scaled pattern. The upperwing-coverts are duller than in male, mostly bluish-grey. The secondary flight feathers are darker, greenish-black. The head is similar but the bill is dark brownish. Eyes are dark brown. Legs and feet are dull grey. The juvenile resembles female. The young male shows more pale blue on the upperwing. It can breed at one year old. The Red Shoveler is rather silent outside the breeding season. During the courtship displays and if it is disturbed, the male gives a low “touk teuk teuk”. The female utters soft, low trill and sharp quacks. 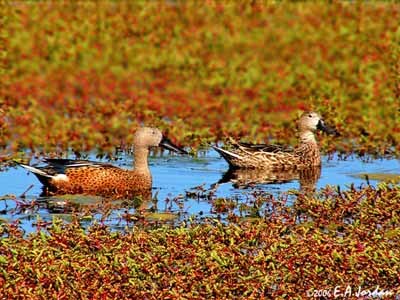 The Red Shoveler frequents mainly large brackish waters such as coastal lagoons and estuaries, but it also can be found in freshwater lakes. This species is often seen in low regions, but it can occur up to 3400 metres of elevation in the Andes. It prefers open areas. 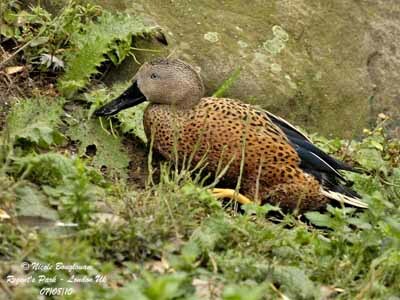 The Red Shoveler is found in southern South America, from Tierra del Fuego northwards to C Chile and most parts of Argentina, and on Falkland Islands. There are small isolated breeding populations in S Peru. 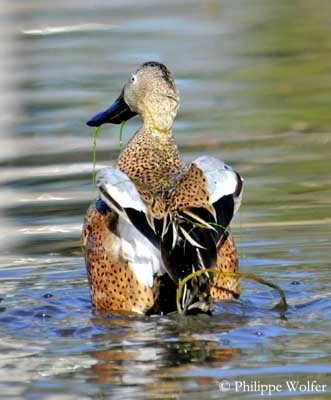 The Red Shoveler feeds on aquatic vegetation such as seeds and parts of aquatic plants. It also takes small invertebrates. 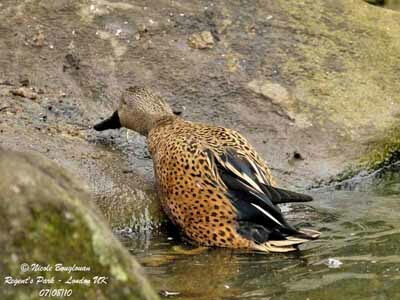 This duck feeds by dabbling, upending and head-dipping. 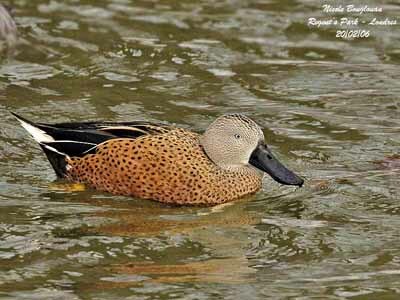 As in other Anatidae species, the bill is equipped with lamellae, which allow filtering water and mud to obtain the tiny preys. During winter, some worms, molluscs and insects are taken and sometimes small amphibians. 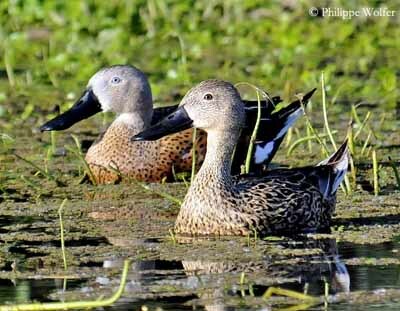 The Red Shoveler is often found in pairs or in small groups. During the moulting period, they can gather in large flocks. The pair forms on the wintering grounds. The courtship displays can be noisy. 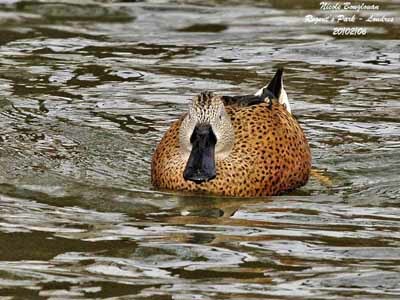 Usually, copulation takes place on the water after several displays such as “head-dipping” during which both birds raise and low their heads slowly, or “head-up-tail-up” swimming posture directed at the selected mate. The Red Shoveler is partially migratory. Populations of the southernmost parts of the range move northwards to winter, and can reach S Peru and Brazil. Other populations are sedentary. 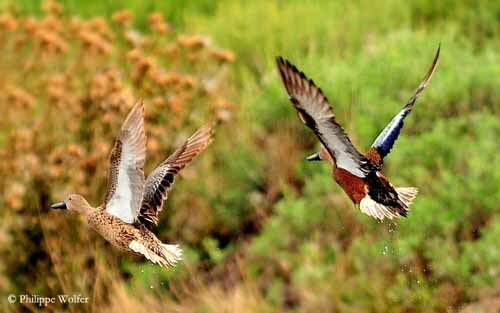 The Red Shoveler has fast flight. This duck is able to take off easily, compared to other species. The breeding season starts in September-October. 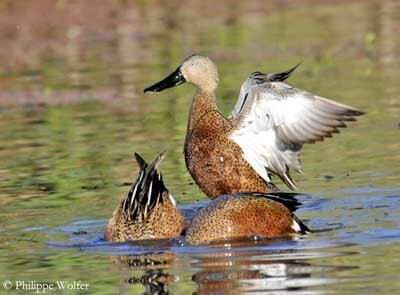 The Red Shoveler can nest in single pairs or in loose groups. The nest is on the ground and made with twigs, reeds and dry grass. The female lays 5-8 eggs and incubates alone during about 25 days. At hatching, the chicks are covered in brown down above and yellowish-cinnamon below. The male does not take part in nesting duties, and the female rears the chicks alone. 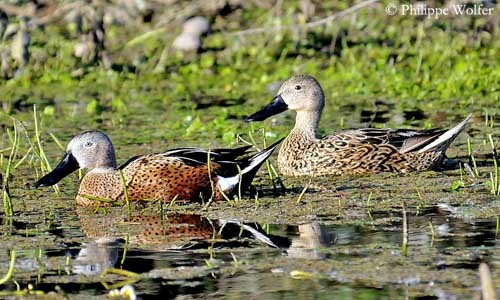 The Red Shoveler feeds on aquatic vegetation, seeds and parts of aquatic plants, and also small invertebrates. It feeds by dabbling on fresh or brackish waters. During winter, it can take some molluscs and worms, and small amphibians. The Red Shoveler is common and widespread in its range. The species is not currently threatened. 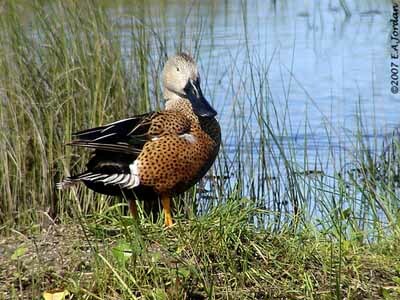 However, degradation of wetlands and hunting pressure in some areas could become threats in next future.